The Dealer must stand on 17 in this game. Player may double down on any two cards, even after a Split. Only one split is allowed. 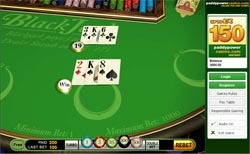 Blackjack is possible only on the first two cards (not on split aces), and split aces receive only one more card each. Insurance bets are available, but there is no option to surrender. Any 11 card player hand that is not bust will beat any dealer hand except for blackjack. The minimum wager permitted in Table Blackjack is €/£1, and the maximum is €/£1000. Betting is easy – chips come in five sizes, from 1 to 500. This lets you quickly and easily place the right bet. The payout schedule is standard: blackjack wins pay at 3:2, and normal wins pay 1:1. insurance bets pay out at 2:1. In the event of a tie, all bets push. The visual appeal of this game is definitely one of its biggest selling points. It has an old style feel to it, which really works well for this game of classic blackjack. The cards feel a bit aged, and the faces on them are drawn in an old style. Smooth animations add to the flavor of the game, and help blend everything together. Gameplay is the same as all WagerWorks blackjack games – smooth and simple, with no need to hunt for buttons or wonder what’s going on while you are concentrating on your game. This is classic Blackjack, so there is nothing new to learn, and no gimmicks to consider. Whatever your favorite strategy is – memorizing tables or any other method – just use it here and we wish you luck! This is as classic as Blackjack gets – the good old game, with all the fun and excitement but without all the fuss. The old style graphics add so much to the feel of this one that we had a hard time getting back to work after we tried it out! It’s another great blackjack game from the labs at WagerWorks.